In conceptualizing how the insights of critical interdisciplines—feminist studies, postcolonial studies, or science studies, for example—might be incorporated into the field of Asian history, two possible scenarios come to mind: in one, critical vocabularies are selectively adopted and perhaps genuinely inspire new ideas, but the overall enterprise remains unmoved; in another, the foundational issues at stake in the interdiscipline become themselves the subject of the Asia historian, thus transforming the questions that are asked and the way research is carried out. It is the latter approach that Sean Hsiang-lin Lei brilliantly demonstrates in Neither Donkey Nor Horse: Medicine in the Struggle Over China’s Modernity, one in a series of new studies on the history of medicine in twentieth century China. What is unusual about Lei’s book, as he outlines in Chapter 1, is that, unlike most scholarship on Chinese medical history, it does not separate Chinese medicine from Western biomedicine. In other words, it does not uphold the dichotomies of modernist discourse that necessitate an imagined divide between nature and culture, West and non-West, modern and non-modern (see Bruno Latour We Have Never Been Modern). Instead, applying the insights of postcolonial science and technology studies, Lei tells a story of the “coevolution” of Chinese and Western medicine, a process in which both forms were highly politicized and both transformed continuously in relation to one another and to the Chinese state. Modern Chinese medicine, as Lei shows, is a new entity—what he calls a new “species”—which emerged out of reciprocal interactions during the early twentieth century, when China was in the process of defining its own modernity. It was precisely the innovativeness of this new species, whose proponents dared to challenge the universalist conception of modern science, that made this new medicine appear dangerous, leading to its being derisively labeled “mongrel medicine” (雜種醫). 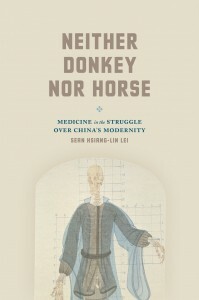 Lei writes, “‘Neither donkey nor horse,’ [this was] a new medicine that demonstrated in concrete terms that the relationship between Chinese medicine and modernity was not to be antithetical” (p. 15). The emergence of China’s new “mongrel” medical species, therefore, posed a challenge much larger than the field of medicine: it brought into question the very idea of Western modernity. One of Lei’s major insights in this book is that the debates over Chinese medical policy were in fact struggles over how to define Chinese modernity, an issue that continued into the socialist period. Lei shows how, during the 1920s, 1930s, and 1940s, practitioners of Chinese medicine continuously pushed for a redefinition of modernity that could accommodate local forms of knowledge and medical practice, while promoters of science resisted this possibility, insisting that science replace all previously existing belief systems to make China modern. This latter approach, promoted by May Fourth reformers such as Fu Sinian (1896-1950), is what Lei calls the monotheistic framework in which science becomes the ideology of modernity, or “science as modernity” (p. 11). The fact that Chinese medicine was never fully embraced by the Nationalist government, whereas it was later by the Communists, is a function of the fact that, in Lei’s words, “Marxist ideology allowed [the Communists] to hold a rather different relationship to the concept of science and to the capitalist West” (p. 275). In other words, while the Nationalist government was committed to the idea of universal Western modernity as represented by the imagined purity of science, the Communists nurtured “mongrel medicine,” allowing it to fulfill its potential as an alternative modern, offering a model not only for China but for postcolonial subjects more generally. While Lei’s sympathies are clearly with promoters of Chinese medicine like Chen Guofu (1892-1951), who led the way in creating mongrel medicine and conceptualizing alternatives to universalist modernity, part of what makes this book so rewarding is that Lei refuses to romanticize any one side of his coevolutionary triad: practitioners of Chinese medicine, practitioners of Western medicine, or the Nationalist state. Instead, as a historian, Lei is interested in understanding how these groups related to one another within specific historical contexts—what drove their actions, how they formulated and articulated different strategies at different times in relation to one another, and the constraints and possibilities that made some actions effective and others not. The narrative that results is a fascinating story full of moves and countermoves, populated by individuals and groups who were motivated as much by interests of their own survival as by grand ideas of truth, well-being, and social progress. Lei’s story begins with two key moments in Chinese medical history: the public controversy over whether to apply Chinese medicine to Sun Yat-sen on his deathbed in 1925 and the explosion of international interest in acupuncture after James Reston’s New York Times report in 1971. The historical question motivating the book arises from the apparent contradiction between these two events. That is, what happened during the decades immediately following 1925 that allowed Chinese medicine not only to survive the epistemological violence of Western modernity (making it one of the only forms of traditional medicine in the world to do so, as Lei points out) but to become one of its most successful counter-discourses? The answer to this question begins, somewhat counterintuitively, by moving backward chronologically, to the first major confrontation in which Western medicine came out clearly ahead in its contest with Chinese medicine: The Manchurian Plague of 1910-11. It was during this event, Lei argues in Chapter 2, that Western medicine gained its crucial foothold with the Chinese state, by proving its utility through public health measures against infectious disease. This begins Lei’s discussion of Western medicine’s first major transformation in the Chinese context. As he shows in Chapter 3, the version of Western medicine that was initially introduced to China by medical missionaries was “individualized” and “focused on curative treatment” (p. 47). However, by the 1920s it had shifted to a focus on public health. Marked by the establishment of the Ministry of Health in 1928, two major principles of modern Chinese medicine had emerged: the state became the subject of medical history and practitioners of Western medicine became its agents, by way of their transformation into architects and promoters of public health initiatives. With Chapter 4, Lei moves to the first series of transformations in Chinese medicine. By comparing the ideas of Tang Zonghai (1851-1908), in the 1890s, to those of Yun Tieqiao (1879-1935) and Yu Jianquan, in the 1920s, Lei shows how debates between the defenders of Chinese and Western medicine shifted from attempts to bridge the two sets of theories (as exemplified in Tang’s idea of qi-transformation) to a debate over ontology. Lei shows how this shift was driven by a series of publications by Yu Yan (1879-1954), one of the staunchest critics of Chinese medicine, and was designed to corner Chinese medicine into a discussion of ontological issues that, in Lei’s words, enforced “the zero-sum game of scientific realism” (p. 152). In other words, critics of Chinese medicine attempted, through their focus on ontology, to establish a discursive encounter in which the human body was describable either through Western or Chinese medical theories, but not both. In the first of several ingenious observations, however, Lei demonstrates that the foray into ontology actually helped mongrel medicine, since it brought about the birth of an important idea: Chinese medicine as “experience” (jingyan). Thus begins Chapter 5, which tells the story of how practitioners of Chinese medicine, galvanized by yet another attack by Yu Yan (this time a 1929 proposal to abolish Chinese medicine), rallied together and eventually gained their own foothold of state support. With the establishment of the Institute of National Medicine in 1931, Chinese medicine successfully avoided the fate of being abolished, while it also began a long process of scientization. Showing how visual imagery could become a tool in this debate, Lei spends Chapter 6 analyzing a chart outlining Shanghai’s medical world that was created by a proponent of Western medicine. He shows how through the manipulation of labels and boundaries, unity emerged out of disunity (in the case of Western medicine) and danger out of diversity (in the case of Chinese medicine). It provides a useful view into the complexity of medical practices in China at this time. Chapter 7 resumes with the story of Chinese medicine’s transformation, with the emergence of mongrel medicine. To explain this process, Lei delves into the idea of “scientization,” a concept all too familiar to historians of modern East Asia, but which Lei rightly points out is in need of more theoretical attention than it currently receives. In what for me was the most exciting chapter of the book, Lei retraces the complex process by which Chinese medicine went from being an object of preservation to one of change, through a process known as “putting in order” (整理). Lei’s treatment of the power dynamics at play in this process is especially commendable; he shows that scientization was a destructive process aimed at demolishing Chinese medicine, but that practitioners of Chinese medicine nevertheless supported it because they had no other choice. In Chapter 8, we then see how this submission to scientization, specifically to germ theory, brought about one of the most important features of modern Chinese medicine: “pattern differentiation and treatment determination” (辨證論治). In Chapter 9, we see that despite some positive outcomes, the scientization framework was still limiting in other ways. Through an illuminating analysis of the discovery of anti-malarial drugs within Chinese medicine, Lei shows how such breakthroughs could only result from anomalies, since the system of drug research protocol itself was designed to suppress them. Lei’s incisive critique of the politics of knowledge involved in “complete translation” (pp. 218-19) offers one of the book’s few (and very welcome in my view) breaks from an otherwise staunch scientific agnosticism. He argues that research protocols designed ostensibly to protect patients nevertheless negated the local knowledge of Chinese medical practitioners, stripping Chinese medicine of its capacity to produce effective clinical research outcomes. In the book’s final two chapters, Lei offers a series of suggestions for how one might see the development of “mongrel medicine” in Republican China as a basis for the development of Traditional Chinese Medicine (TCM) in the socialist period. Returning to the question of public health, Chapter 10 looks at the growth of State Medicine in the context of the Nationalists’ struggle for political support in rural China. He argues that State Medicine, though inspired by the British system, was a local creation that allowed China to become a model for later global health practices. Lei shows how the Ding County experiment of 1931-37 paved the way for a new focus on rural health. He also shows how, despite well-conceived arguments by practitioners of Chinese medicine, the Nationalist government never realized the capacity of Chinese medicine to serve this project, due to powerful entrenched prejudices in its medical system at the time against “mongrel medicine.” It was not until the Communist era, Lei argues, with “the rise of a new and alternative vision of science” that this possibility was finally realized (p. 256). In Chapter 11 the deeper stakes of Lei’s project become clear as Lei moves more explicitly into a discussion of the development of Traditional Chinese Medicine in the socialist era. In his critique of Kim Taylor’s book, Lei shows his disagreement with the view that today’s TCM be seen as a product of cultural nationalism propelled by political interests of the PRC state. For Lei, such an argument is far too simplistic, and it trivializes what for him is the bigger problem at the heart of the Chinese medicine debates —the possibility of plural modernities. For Lei, limiting this question to one of cultural nationalism is fundamentally problematic, because it shifts the conversation away from transnational issues—the shared violence experienced by non-Western peoples in the face of Western modernity, the need to develop theoretical paradigms that challenge modernist discourses—to one limited by national boundaries and national concerns. Thus, Lei ends with a very provocative idea: does Communist China, through its inheritance of hybrids forged in the Nationalist era, offer a potential answer to the problem of postcolonial modernity? Ultimately, because the book is a study of medicine in its relation to the Republican state, not the Communist one, Lei does not answer this question fully. Oddly, given Lei’s position as a Taiwan-based scholar, he also never considers the development of Chinese medicine in Taiwan after 1949 as a comparative case. What Lei does provide, however, is an extremely useful method for thinking about and constructing research on Chinese modernity, one that has engaged, on a very deep level, the critical frameworks developed by science and technology studies and, to some extent, postcolonial thought. From Lei’s example, we learn that the most productive way of approaching twentieth century China is to think relationally, looking not at dichotomies of modernity and tradition but, rather, at the new hybrid species that their relationships produce. East Asian modernity, as Lei shows us, is populated by and generated through these hybrids, as is modernity everywhere. The series also includes: Bridie Andrews’ The Making of Modern Chinese Medicine, 1850-1960 (University of Washington Press, 2014) and Kim Taylor’s Chinese Medicine in Early Communist China, 1945-1963 (Routledge Curzon, 2005). I use this term, as Lei does, to indicate a form of medicine practiced in China that is itself hybrid. Lei gives many examples throughout the text of ways in which research by Japanese scholars, for example, shaped Chinese medical theory and practice during his period of study. Thus, like the term “Western medicine,” “Chinese medicine” here is a placeholder for what is in fact a much more complex set of medical practices.